Not suitable DFT furniture terminals may be installed in old systems, in this case please contact your responsible Häfele employee. The MLA 8 multi-lock adapter is the link between the FT 120 or FT 130 furniture terminal and furniture lock in cases where more than one furniture lock has to be actuated. 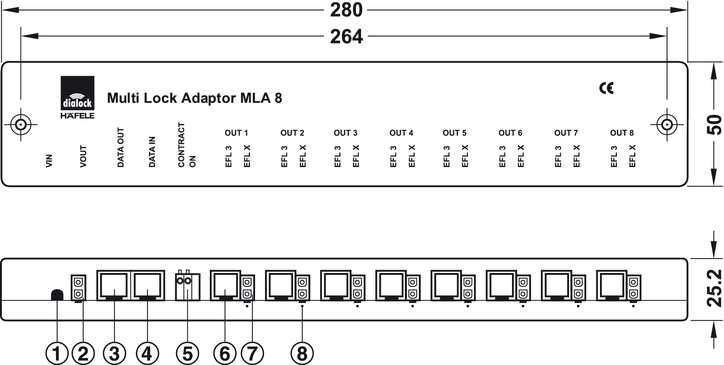 The MLA 8 multi-lock adapter uses the incoming data signal from the FT 120 or FT 130 furniture terminal and forwards it to the EFL furniture locks in the form of a pulse for unlocking/locking. Transfer of feedback contacts (plug + play wiring of feedback contacts between furniture locks and furniture terminal). Macro required. Please ensure that a sufficient voltage supply (see output current) is provided. The system can be easily extended with an additional MLA 8 at a later date. The configuration card # 89 (917.42.122) is required for training the MLA 8 at the FT 120/130 and in order to keep existing programming. Please order fixing material (Hospa countersunk screws 4 x 35/4 x 55) separately. 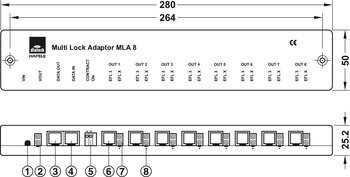 The MLA 8 must be trained at the FT 120, FT 130 furniture terminal with the configuration card # 89 (917.42.122) so that it is recognised during initial programming.